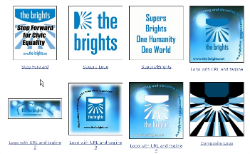 Let the world know you are a Bright! The Kiosk at Zazzle carries the basic icon merchandise for drawing attention to the movement: T-shirts, a grocery tote, and buttons. 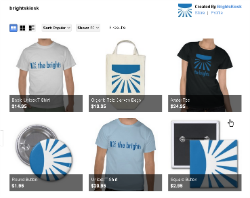 Check back periodically to see the latest merchandise availablity. The Shop at Café Press carries a large variety of Brights-themed merchandise and some authorized logos and maxims. Besides varied apparel, you'll see mugs, bumper stickers, posters, and a host of other products.